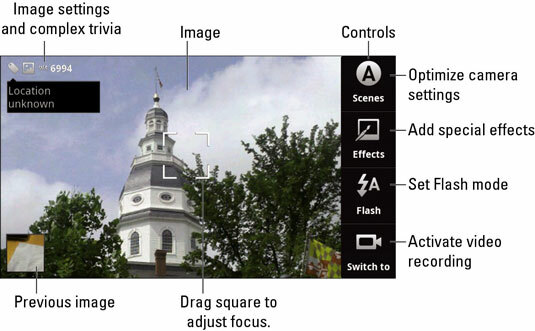 Scenes: Preconfigure the Droid X camera for taking certain types of pictures. After touching the Scenes button, swipe the options left or right. Choose one to configure the camera to, ideally, take that type of picture. Auto Flash: In this mode, the camera determines whether the flash goes off. Sometimes it does, such as when it’s dark, and sometimes it doesn’t, such as when you’re taking a picture of the sun. Flash On: The flash always blinds your victims. Flash Off: The flash never goes off, even in the dark. Effects: Add special color effects. After choosing an effect, press the Back soft button to take your picture. Single Shot: Normal camera mode. Panorama Assist: The camera helps you capture wide or tall shots by assisting you in taking multiple images that can be laid out in a panorama. Self Portrait: Use face-recognition technology to take your own picture. To make face detection work, it must be turned on: Press the Menu soft button when using the Camera, then choose Settings→Face Detection to place a green check mark by that item. 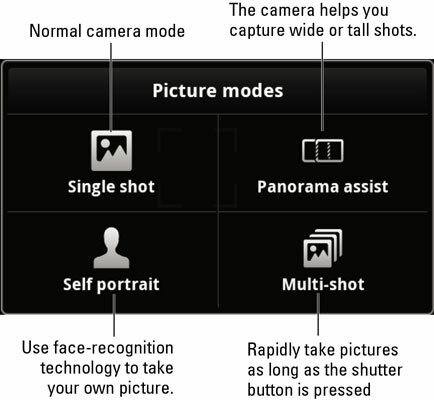 Multi-Shot: Rapidly take pictures as long as the shutter button is pressed. 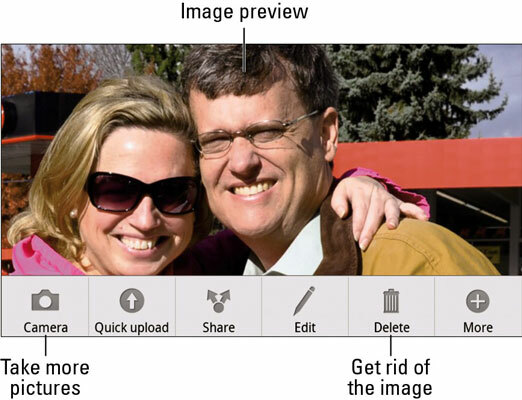 This feature is useful for capturing action pictures, such as in sporting events or when viewing train wrecks.